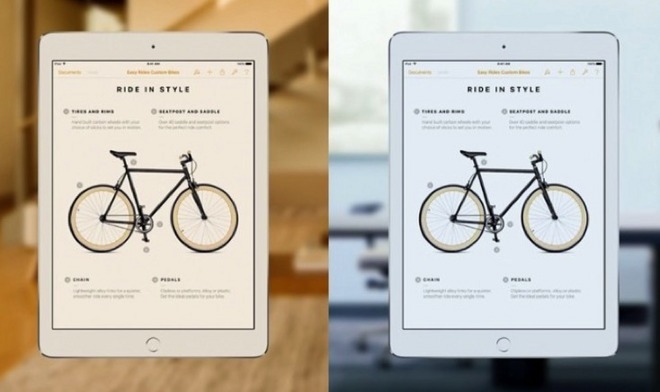 While True Tone technology is currently exclusive to Apple's latest flagship iPad, a new patent application signals it has interest in expanding the color management capabilities to other devices, potentially ranging from as small as an Apple Watch to as large as an iMac. The US Patent & Trade Office published an Apple patent filing on Thursday, discovered by AppleInsider, that details the technology that would eventually be introduced to the world this March as the iPad Pro True Tone display. In the filing, Apple notes that the ultimate goal of its advanced display technology is to have "colors appear as they would on a printed sheet of paper." That's similar to Apple's own marketing materials for the 9.7-inch iPad Pro and its True Tone display, which it boasts is "almost like looking at a sheet of paper." As with most applications, Apple's proposed invention is all-encompassing, noting that while OLED displays are shown in accompanying illustrations, any compatible display can be used to implement the patented technology. The filing suggests the technology could have practical applications on devices ranging from small wearable displays, like an Apple Watch, to large desktop computers, such as Apple's iMac. 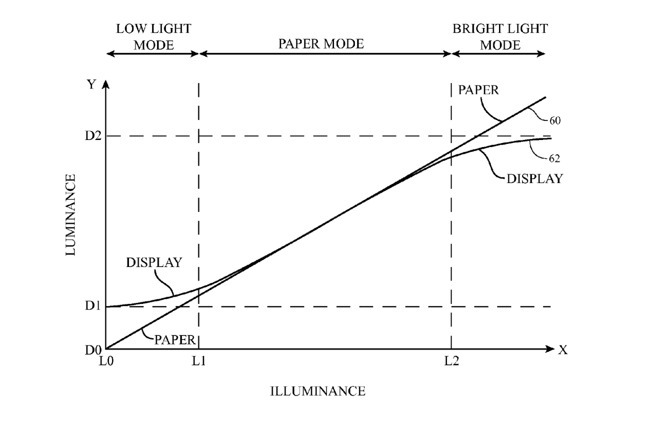 In the filing, Apple states that a True Tone display will adjust the light it emits according to its environment. For example, in a low-light situation, the display will mimic the appearance of an incandescent light source, while in a bright setting, the display may maximize brightness to improve readability. Apple notes that in addition to offering more accurate color, its display could also produce warm light later in the evening to help users get to sleep at night. That capability was already introduced as Night Shift in iOS 9.3, and it doesn't rely on the unique advanced ambient light sensors in the 9.7-inch iPad Pro, making it also available on other iPads and iPhones. While Night Shift is already on the iPhone, True Tone remains exclusive to the 9.7-inch iPad Pro— for now. But there are some signs that True Tone support could expand to the iPhone in the near future. Just this week, a new report claimed that Apple's anticipated "iPhone 7" will feature an improved set of ambient light sensors. And earlier this year, it was said that the next iPhone will feature two mysterious sensors at the top of the device, though their purpose is unknown. Those could be taken as indications that Apple could bring its True Tone display technology to its best-selling product. The 9.7-inch iPad Pro, which debuted in March, utilizes four sensors to measure the ambient light conditions. Feedback from the sensors allow for alteration of the display's white point and brightness to ease eyestrain for readers, prevent overexposure to blue-toned light which is said to interrupt sleep patterns, and to assist in accurate color calibration of the device. 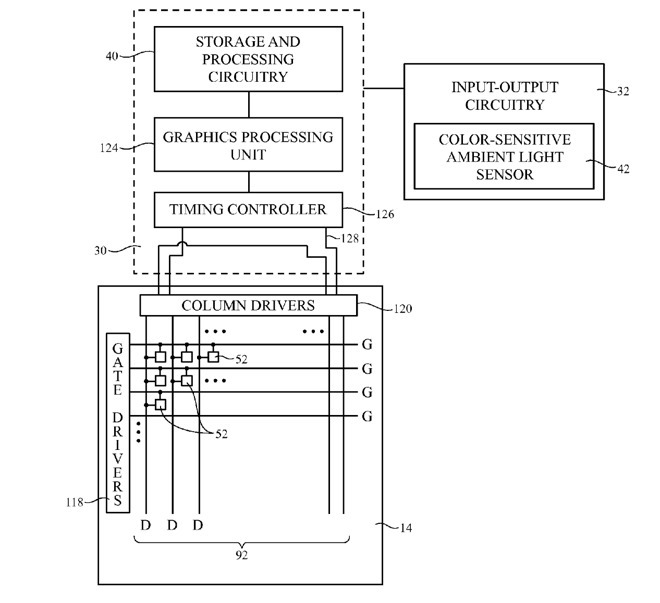 Application number 20160180780, titled "Ambient Light Adaptive Displays with Paper-Like Appearance" is attributed to Apple engineers Cheng Chen, Wei Chen, Will Reidel, Jiaying Wu, and Jon Z. Zhong.